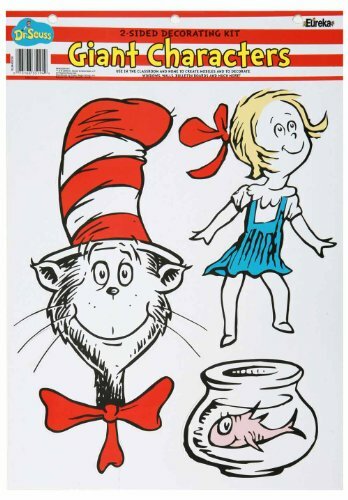 Amazon: Dr. Seuss Wall Decals Decor Kits - Low Price Alert! Home Amazon Amazon: Dr. Seuss Wall Decals Decor Kits – Low Price Alert! Amazon: Dr. Seuss Wall Decals Decor Kits – Low Price Alert! Dr. Seuss Wall Decals Decor! Love Dr. Seuss? Look at these Dr. Seuss Wall Decals we found (on sale) on Amazon! Hurry and get the Eureka Back to School Dr. Seuss The Cat in the Hat Classroom Decorations for Teachers, 6pc today for $10.98 only $8.56 from Amazon! This product has many variations at different prices! Quickly see them all here. Check out all of the Amazon deals here! Pieces range from approx. 4.75” to 14.75” tall. Add these fun Cat in the Hat cutouts to walls, bulletin boards or windows to create a fun and engaging learning environment for your students. These Dr.Seuss classroom decorations featuring characters from Cat in the Hat will add a pop of color to any dull classroom. Each set includes multiple pieces that are printed with the same design on both sides. All pieces remove easily from the sheet and are designed with pre-punched holes to allow for hanging. Create fun and engaging walls, windows and bulletin boards with these creative Dr.Seuss classroom wall decals. They will add a fun pop of color to any drab classroom. Includes (6) pieces ranging in size from 4.75” to 14.75” tall. .
Buy the Eureka Back to School Dr. Seuss The Cat in the Hat Classroom Decorations for Teachers, 6pc from Amazon. Previous articleMelissa & Doug 4-in-1 Wooden Jigsaw Puzzles – Best Prices!